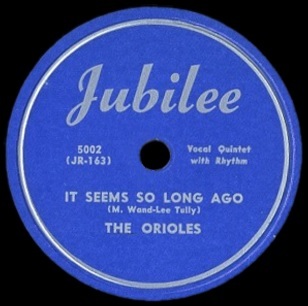 With this being the third review for The Orioles in recent weeks and all featuring similar sounding records with similar problems which were actually first apparent on their final review from 1948 back in November, we’re getting a sense of déjà vu around here. No doubt you’re as tired of reading the same points being made as I am about making them, but what can you do? When covering rock history you simply take the records as they come and that’s going to mean stretches where artists seem to have trouble getting around certain self-made obstacles. The fault for that may be theirs but the job for us is to find some new way to analyze it so we don’t try your patience and lose our minds in the process. So welcome to the speed round of Spontaneous Lunacy, where we dispense with the usual lengthy set-ups and various sidetracks we’re known for and give you a condensed version of a review, sort of like those tiny individual cereal boxes or a bite-sized candy bar, it may taste the same but hopefully you won’t feel so full after consuming it. You’ll also have more time to go mow the lawn, shovel the snow, clean the gutters, do your homework and cook dinner. No need to thank me for our thoughtful consideration as to the value of your time. 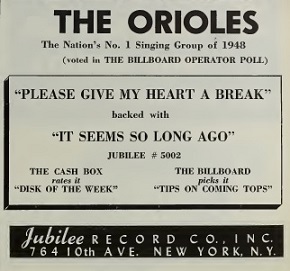 Six months after their debut the blueprint for The Orioles seems set, as regrettably their manager Deborah Chessler and Jubilee label head Jerry Blaine were taking aim at the pop charts with increasingly restrained ballads and It Seems So Long Ago is no exception. We’ve already thoroughly gotten into the folly of this from a commercial standpoint as well as an aesthetic one, but what really strikes you when you hear these records played back to back is the sheer repetitiveness of their approach. 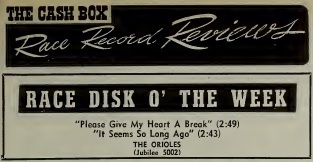 They’re all languorous ballads meant to highlight Sonny Til’s tender delivery and backed with unobtrusive wordless harmonies by the other Orioles. The result is a thin – almost transparent – sound on each record which is further exacerbated by the practically non-existent musical support so as not to overwhelm him and the message the lyrics impart. It’s the musical equivalent of lace doilies, fairly pretty but utterly useless. We can rail against the tinkly piano all we want when targeting its flaws but as unwelcome as that is the real problem remains the lack of any OTHER accompaniment to bolster the sound. The record label itself promises “Vocal Quintet With Rhythm” but that’s a cruel hoax meant to torment us further. Had they actually added some drums to the track, not even utilizing the bass drum or dropping in any cracking snares (God forbid! ), but just offered some light rim shots or even brushes to convey a sense of rhythm, however slight, the effect would do wonders for all of these misfires. Without that there’s no forward momentum, nothing to get you in a trance, to move your shoulders even slightly. You’re left to cling to the melody alone and with the pace slowed to a crawl on most of these songs it’s like trying to grip a greased railing on a boat in rough waters, you’re gonna wind up on the deck or in the ocean and there’s nobody on these sessions to throw you a life preserver. It’s as if once they felt like they found their niche they were paralyzed with fear at the thought of issuing anything but more of the same. But we know how stifling that can be, not only to their own creativity but also the fan’s desire for something to strike a different chord in them. While it’s certainly true that females worshipped Sonny Til in large part because of these types of yearning ballads that had them wanting to comfort him, there remained OTHER avenues to stoke those same female desires. Can you imagine what the response might’ve been had he revved it up once and acted horny for THEM in the process, even for just one song?!?! I think it’s safe to say that Neil Armstrong wouldn’t have been the first to step foot on the lunar surface twenty years later because listening to Sonny Til wail uncontrollably how much he needed her would’ve caused some girl to launch herself to the moon on hormones alone! But instead we’re stuck on repeat here as It Seems So Long Ago adheres to the same framework as everything else they’ve done recently until the songs begin to sound interchangeable, the sentiments – all heartbroken longing – offer no new perspective and no respite from the emotional misery he always finds himself wallowing in. Your sympathy for Sonny Til which had been so high the first time out when he wondered if the girl he loved might possibly love him too has now become almost farcical. Dammit, you want to tell him, stop acting like a wuss and go out and get ANOTHER girl! Or at the very least don’t burden US with your inability to make any headway with whichever one you’re hung up on at the moment. I suppose all of this would be more tolerable with a better song, a stronger melodic structure and more for the other Orioles to do rather than hold Sonny’s coat while he warbles to himself in the mirror after too many drinks. It’s not that these types of songs CAN’T work after all, we know they can, but they can’t work every time out when you’re hinging it all on things that are in desperately short supply, namely an inventive way to tell the same story for the sixth time already, a subtle but catchy hook to keep us coming back, a melody that sticks in our head longer than it takes for the record player’s arm to come to a stop after the needle lifts out of the groove and most of all the sympathy for someone who needs to man up and stop whining about the same predicament he finds himself in with each girl… or is it the same girl? Either way maybe he should resign himself to being single. While Sonny does have a few quality moments here they’re not nearly as many as we’re used to with him. His voice soars nicely at times, showing an understated power, but truthfully when George Nelson’s baritone takes the bridge (yet again – that’s another problem, no surprises in the vocal arrangement either) he nearly matches him – not in terms of vocal skill but just in terms of conveying the same feeling. They tend to blur together after awhile. That lack of variance within the song itself gets on your nerves. You feel as though you’ve lost your place in the proceedings, the words start to lose meaning, the whole thing feels as if it’s nothing more than greeting card sentiments, shallow if not entirely insincere. When the entire key to their early appeal was their sincerity, their ability to convince you everything they sang had just recently happened to them personally and they were struggling to speak it out loud because it was still too painful, what was left once we no longer believe this to be true if only because we’ve heard it all before? If they haven’t lost us completely yet they’re certainly in danger of it. It Seems So Long Ago is at least an apt title if nothing else because it does seem so long ago when The Orioles were the hottest, most strikingly vibrant new group on the scene. But that was just six months ago and in rock music time never stands still. The world they seemed poised to take over now has passed them by. I’m fully aware that as musical and historical analysis goes this brief epitaph for their rapidly sinking career is not very deep, not very insightful, certainly not very original. But neither is the song and that’s the problem. There are two sides to each record, therefore two different style songs can be offered. In the late 1940’s popular artists have up to a half dozen singles released in one year, thus there are up to twelve potential approaches to try. We don’t expect something completely different each time out, I don’t want to hear The Orioles singing polka music or trying their hand at corny jive, but how about putting the foot on the accelerator, turning down a side road, or at least change lanes for once. Instead they do nothing of the sort. A hit record should buy you room to experiment, TWO hits should get you a year’s get out of jail free cards for anything you want to try. Their experiments don’t have to be put on the A-sides, but something they do needs to be fresh enough, interesting enough to keep us on board. At least give us the sense they’re experimenting, that they might pull off something to surprise us next time out, then we’ll throw down another 79 cents for the next record without complaint. But this bland and uninspired dreck isn’t enough. They may sing all of these songs just fine but if we feel as if we’ve seen this show before why would we pay for another ticket? The freshest group of 1948 – one that only first appeared in July – has descended into formula and it’s only February 1949. Sometimes short reviews are done out of mercy and so the less said about their self-inflicted plight the better it is for their dwindling reputation. Leave a reply on "The Orioles: “It Seems So Long Ago”"